Steamed fish is one of my favorite dishes as it is healthy, delicious and so easy to make. One of them is this Teochew Steamed Fish. The sour, savory and spicy flavors from the broth is what makes this dish extremely appetizing and addictive. I first tried Teochew steamed fish many years ago in a restaurant in Ipoh and I’ve been hooked ever since then. Even though the broth looked deceptively clear, it was packed with amazing flavors. 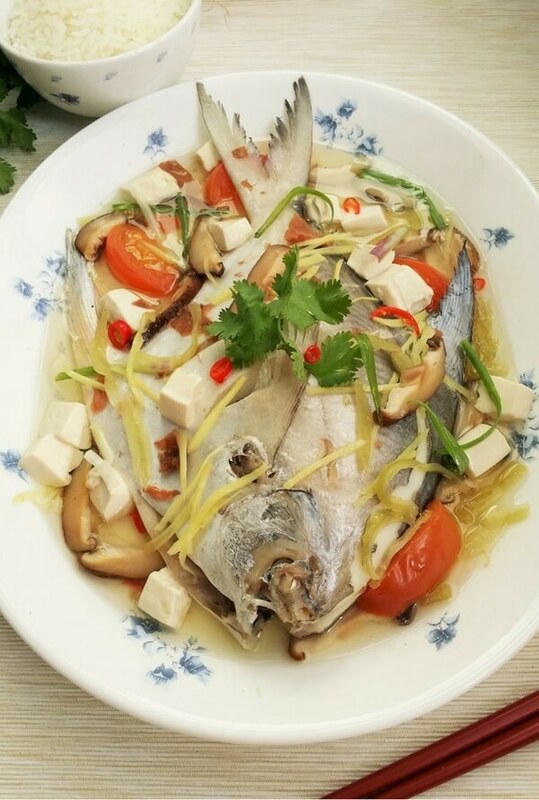 Typically, Teochew steamed fish is piled with lots of ingredients all over but their had just the bare minimum of each ingredient and even the salted plum could not be seen. Still, the fish was very fresh and I did not expect anything less as the Teochews are well known for placing great emphasis on using the freshest seafood. Teochew cuisine, also known as Chiuchow/Chaozhou cuisine is well known for its seafood and vegetarian dishes. Compared to other Chinese cuisine, it takes a less heavy-handed approach to flavoring and relies mainly on the freshness and quality of the ingredients for taste and flavour. Ordering steamed fish in a restaurant can be very expensive so I prefer to do it at home. This is one of my favourite way to cook a fish when it is fresh – Teochew style with salted plums, shiitake mushrooms, soft tofu, juicy tomatoes and salted mustard green and always with a drizzle of some shallot oil. Speaking of shallot oil, I usually make a batch enough to last me for about a week. I use it to drizzle over my steamed dishes like fish, steamed eggs, and to marinade meat, etc. It gives a lovely fragrance to any dish that I add them to. When it comes to steaming fish, using good fresh fish is essential to enjoy it to the fullest. It is common in Chinese cooking to steam a fish when it is fresh and to fry it when it isn’t. 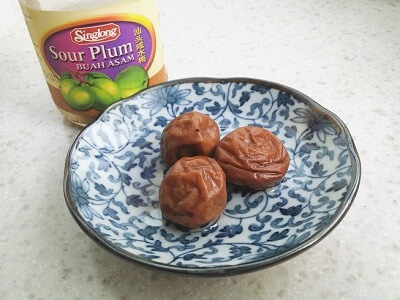 Salted plums is an essential ingredient in Teochew steamed fish. They can be found easily in the Asian section of a supermarket. These plums are very soft and you can mash them easily with your fingers or a spoon for this recipe. 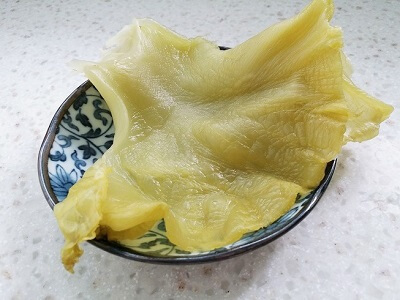 Salted mustard green (xian cai/kiam chye) is another essential ingredient in Teochew steamed fish. If you’re concerned about the high sodium content, soak them in hot water for around 10 minutes to reduce the excess salt. I used about half of this leaf for this recipe. Although steaming this fish is pretty straightforward, there is a lot of preparation work involved such as slicing all the ingredients finely. I like how all the finely sliced ingredients add a burst of color against the flesh of the fish. They are not only pleasing to the eye but also add texture and enjoyment to the dish. I used silver pomfret for this Teochew steamed fish recipe, as its flesh is smooth and tender. You can also use Chinese pomfret (pampus chinensis, Dao Chior) which is prized over silver pomfret but it also costs more. Other fish suitable for this kind of steaming are most white-fleshed fish like garoupa (grouper), red or white snapper or Asian sea bass (jīn mù lú). If you are using a thicker type of fish, you can also butterfly it for steaming. Avoid using black pomfret as those are more suitable for frying. When cooking Teochew steamed fish, the cavity of the fish has to be thoroughly cleaned as it will be steamed in its own juices. If not, the resulting broth will turn murky and have a fishy taste. Use a high fire setting when steaming fish and avoid opening the steamer’s cover while steaming to prevent heat from escaping. Do not exceed the recommended steaming time or the fish will become tough. 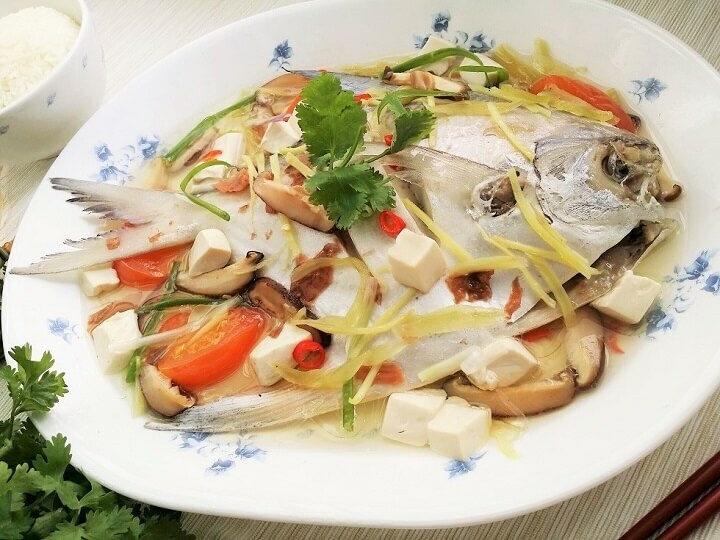 The delicious broth of Teochew steamed fish is good to the last drop. It is delicately saltish-sourish, tangy and very addictive. My daughter kept drinking the fish broth like a soup while I like to eat the smooth tasty flesh of the fish with sliced bird’s eye chili. Although I have overcooked the fish a little, we still enjoyed it very much. We did not just eat. We practically devoured the fish. All manner of decorum was quickly tossed away while we ate. Fins and tail were pulled out and sucked to get that last bit of meat and broth. Yes, it is that good. I know you’re going to love it too. Enjoy! Teochew steamed fish with salted vegetable, salted plums, tofu, shiitake mushrooms and tomato. Clean fish by doing a thorough removal of its entrails. (Best to have your local fishmonger do it for you). Rinse the fish. Make 2 slits on each side of the fish and pat dry. Use a little salt and rub it all over the fish and its cavity. Rub half of the mashed salted plums into the cavity of the fish and put in the slices of ginger. Rub the remaining mashed salted plums onto the body of the fish. 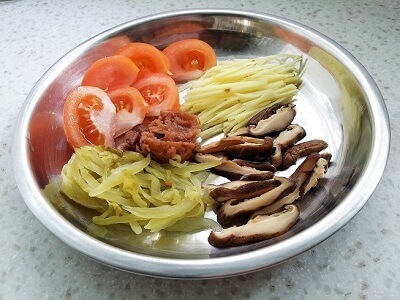 Line a plate with some of the sliced ginger and shiitake mushrooms and put the fish on top of them. Add in water and the rest of the ingredients (except garnishing) on top of the fish and sides of the plate. Fill a wok one quarter full with water. Place a steaming rack over the water and make sure it is above the water level. Bring water to a vigorous boil. Once the water boils, place the plate of fish in and steam on high heat till completely cooked for 10 minutes. While waiting for the fish to be ready, heat up shallot oil till very hot. Once the fish is ready, remove from the wok. 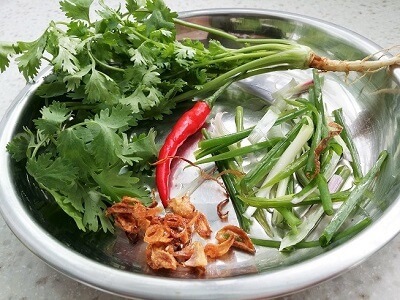 Scatter spring onions and bird's eye chilli on and around the fish and drizzle with hot shallot oil. Finally, garnish with parsley. Serve immediately. For this medium sized fish (around 450g), steam for about 9 - 10 minutes on high heat. Steam for a lesser time if using a smaller fish. Do not oversteam the fish as it will turn the flesh tough. I am mad about food and love trying out new things, and I love food.. It the first time I came across such a fish to make (maybe I did come across it and had no idea what it was). I see you have a recipe as well to try and it something that i would love to try. Thank you for the awesome recipe. Now I have something new to try. Look really nice! I must admit that in my younger years I absolutely hated fish unless it was in batter ( I’m from the UK ). But my partner is from Eastern Europe and she has gradually turned me around to the idea…depending on the recipe! I will have t show this to her and see what she thinks! Wow what a great looking and original recipe! Well original for North America I should say. As a vegetarian who eats fish, this is great. I love the presentation! Love the pop of color of the garnishes and the whole fish. I would definitively have the fish cleaned by a fish person or my friend, who used to be a fisherman! I have to admit that most of the ingredients are somewhat unknown to me but the salted plums look very interesting and it is very original to be rubbing them over the fish. I would prefer to have my fish cleaned by a trusted fishmonger too. I find that rubbing the salted plums over the fish makes the broth more flavorful as compared to using them whole. Thanks for dropping by! Hi there! Can I copy your recipe? Actually I was trying to find another recipe for fish because I am so tired of repeating dishes. On the other hand, fish is way more healthy compared to pork or beef. So can I use this recipe to any kind of fish? And also I don’t have plums available here in our community, do you have any alternatives for those? Thanks in advance for your response. Copy my recipe as in use it to cook at home or copy it on your site? If you’re using this recipe for cooking, refer to the post on suitable white-fleshed fish to use. No, I don’t have any alternatives for salted plums. They are usually available at the Asian section of a supermarket or any Asian/Chinese grocery shop. If salted plums were to be replaced with another substitute, it wouldn’t be Teochew steamed fish anymore.